In 1927, forty students about to enter the eighth grade, along with their teacher, arrived in the morning to open the doors to their small, two-room schoolhouse for the first time. There were already ten public school high schools in Montgomery County, Maryland. But these forty students weren’t allowed to attend any of them because of the color of their skin. 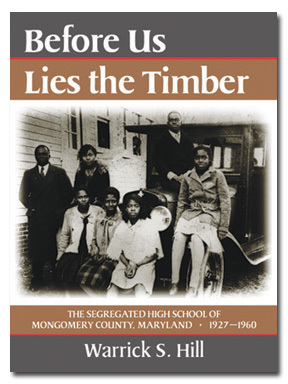 Before Us Lies the Timber tells the complete story of a single high school, first known as Rockville Colored High School. The result of aggressive determination and tireless persistence by local Black leaders, Rockville Colored High School became the first high school in the county for African-American boys and girls eager to continue their education. Before its opening, young African-Americans in Montgomery County were faced with a difficult decision if they wanted to continue their education. They would have to leave their families as the only high schools for African-Americans at that time were in Baltimore City or Washington D.C. The author was himself a graduate of Lincoln High in 1945. Warrick S. Hill has assembled a wealth of not just historical information, but personal stories as well. Each graduating class is given its own commemorative chapter, recreating, year by year, the trials, challenges, and accomplishments of these unique students attending the high school they loved.